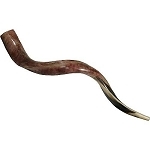 A Polished Shofar is a Shofar that is polished 100% from tip to tip. Our Polished Yemenite Shofars have been tried and tested. They are polished to give a luxurious look and will help make this a treasured keepsake.